For those of us who work full-time, we know how difficult it is to feel motivated to do much outside of the office. This includes socializing and going to the gym. Who has the time or energy to do that after working over eight hours a day, 5 days a week? You may start to notice a change in your body after skipping the gym a few nights a week. Despite how much you want to exercise, all you really want to do after work is eat and go to bed. Luckily, we’ve found the solution. Just because you may sit behind a desk all day doesn’t mean you can’t work out. Check out the 5 seated ab exercises you can do right at your desk below! Start your day at the office with some quick chair bicycle crunches. Though these are typically done on the ground, a pantsuit or dress might prove difficult. Instead, do them right from your chair. Moving to the edge of your chair, pull your stomach in and sit tall. With your elbows pointed to the sides of the room, put your hands behind your head. Lift your left knee up and rotate your torso as you bend down to touch your right elbow to your knee. Repeat with the opposite side. Do this 10 to 20 times on each side. Exercising not only helps your energy levels but boosts memory too. Riding a bike has many benefits including an excellent source of physical exercise. You may not have the time to ride your bike much so we’ve brought the bike to your desk – or at least the movement of riding one. Sitting on the edge of your chair, give your upper body support by using the armrests of the chair. Move your legs into a bicycle pedaling position by bringing your knees near your chest and contracting your ab muscles. Begin moving your feet in a pedal-like motion and repeat continuously. Planks can be mastered anywhere as long as you have a solid surface to lean on and the drive to do it. Place your hands or forearms on a stable chair, your desk, or on the floor and extend your legs behind you with your toes on the floor hip distance apart. Your body should be at an angle unless the plank is on the floor. While maintaining a straight line, contract your ab muscles without moving your hips forward or backward. Hold for 30 – 60 seconds or as long as you are able. Simple waist rotations get your abs and body moving with minimal effort. Sit straight in your chair and pull your abs in. Do this while engaging your other core muscles and rotate at the waist to one side. Stay in the upright position as you hold for five seconds and repeat on the opposite side. Swap out your office chair for an exercise ball and watch it work its magic. Sitting on an exercise ball throughout the day works not only your ab muscles but your leg and hip muscles as well. 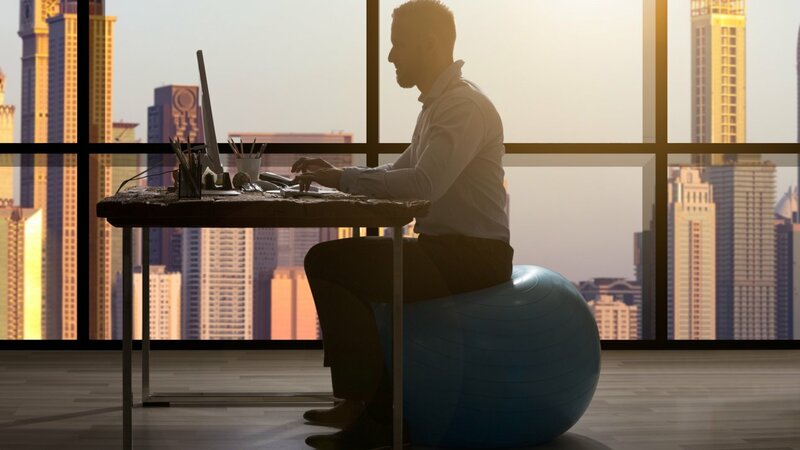 Alternate sitting on the exercise ball and your regular chair for 20-30 minutes throughout the workday. Make sure you are sitting on the proper size exercise ball for your body. Avoid getting discouraged from missing the gym by bringing some exercise right to your office. We know it’s hard to keep up the motivation when the days are long and you’re mentally exhausted. If you need some motivation, check out Nick Santonastasso and his story.